Price Drop! Was: $399.99 Now: $109.99. For a limited time only, while stocks last. If you're looking for a great way to get your body in shape with little effort and enjoy music at the same time, then this Genki vibration machine is perfect for you. 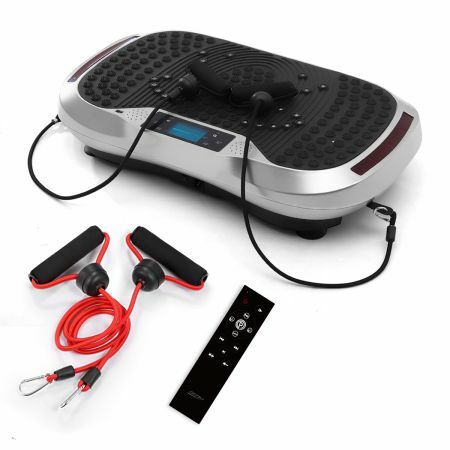 This portable vibration platform burns fat and tightens skin by increasing your metabolism for your whole body, while also featuring a bluetooth music player for your enjoyment. The vibrations reshape the body in the hip, waist and abdomen. You can increase muscle tone, strength, circulation and flexibility in 10 minutes a day, 3 times a week. Stop wasting time and money at the gym and order your ultra-slim body vibration machine today! 30.5" x 15.5" x 6" approx. 32.5" x 19" x 7.5" approx. I bought this for my dad to increase circulation in a bad leg. He doesn't stand on it or use the hand bands, but he loves it. He just sits and puts his feet on it, and It often rocks him to sleep. I have only just started using Genkifitness Vibration Platform so a review at this time is premature. The Genki Fitness Vibration Platform is great. It was introduced to me at my Yoga Class. I use it daily to increase my bone density and circulation, besides strengthening my core. If you have tried the more expensive models at the gym or spa that cost over $2000, this little baby will not disappoint!! Your thighs will feel like you ran 20 miles after 10 minutes of "jiggling"! I love it for loosening up my back and you can make subtle adjustments to your posture to allow the vibrations to move in different parts of your body, like up to your neck by slightly leaning forward. I really love this product. I do an am & pm session before eating and not drinking too much prior to use. Just started using the product. So far so good. It comes with the strength straps that help with toning your arms, back and chest that is easily attached to the sides of the equipment, they are very handy and I'm happy they were included with the unit. I have a set that I use independently and I'm happy these were included as they are one of my favorite exercise pieces. Perfect home vibration machine. The whole family uses it before and after workouts. This platform is great for physical therapy, and for those people who aren't able to practice an active lifestyle but still wants the benefits achieved from exercising. Persons who actively train their bodies find this vibrating platform to be a great addition to their routine. Muscles are firmed faster, they are able to work their core, arms and overall body. This also helps in blood circulation and reduction of cellulite.